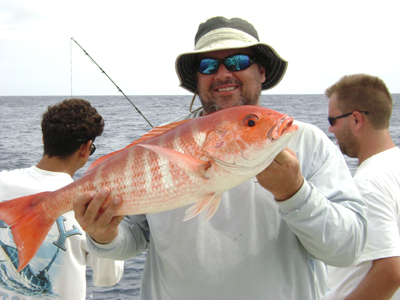 The offshore fishing the past week out of Los Suenos Marina has been a little hit or miss. The boats still seem to averaging 2 or 3 fish per day…usually a sailfish or two and a couple mahi mahi. The boats that are fishing at the “26” rock are getting some 10 to 15 pound yellowfin tuna, some 20 pound mahi mahi and a few wahoo in the 20 pound range. We did some meat fishing Friday with my buddy on the 28′ Carolina Classic and had a great day. 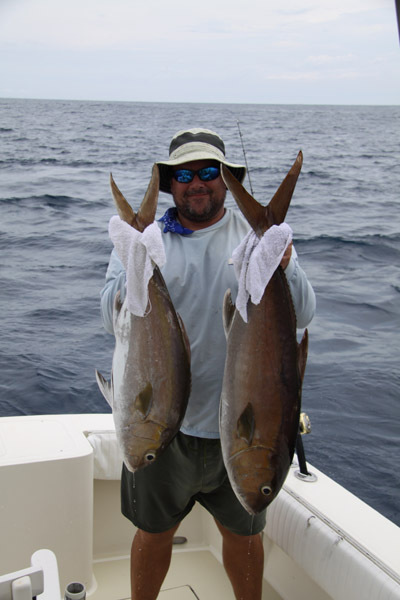 We fished 5 to 15 miles in front of Los Suenos and caught some nice amberjack, grouper, snapper and more. We probably caught 40 fish total. 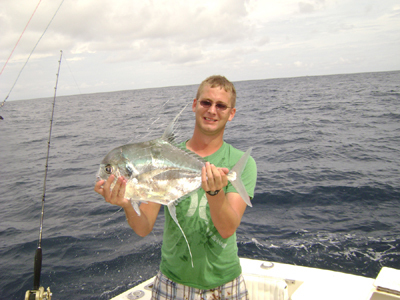 The big fish took live blue runners in 180 ft of water and we caught most of the smaller fish we caught on squid rigs. This entry was posted on Sunday, August 30th, 2009 at 2:45 pm and is filed under Uncategorized. You can follow any responses to this entry through the RSS 2.0 feed. You can leave a response, or trackback from your own site.